Back in 2010, I shared a remarkable chart showing how quickly economic output doubles in a fast-growth economy, but it also showed how long it takes for GDP to expand if an economy only grows 1 percent or 2 percent per year. …even modest differences in economic growth can have a big impact on relative prosperity with a couple of decades. But what’s really astounding – in a bad way – is that there used to be no growth. 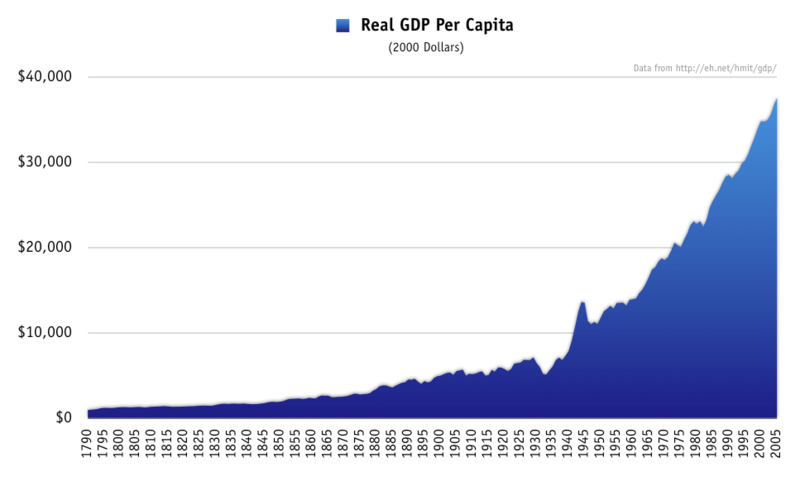 I recently posted a remarkable video from Learn Liberty that showed how the world was mired in poverty for century after century until growth exploded around 1800. Now Don Boudreaux has a similar must-watch video for Marginal Revolution University. The moral of the story is that poverty is, or at least was, the natural state of humanity. But then something remarkable happened. The power of government was constrained and the vitality of markets was unleashed. The rest, as they say, is history. And if you want to see a remarkable case study, the Fund for American Studies has its own great video showing how one nation went from misery to prosperity in just 100 or so years. And to augment that video, here’s a chart from Wikipedia. Just something to have in the back of your mind when some statist naively tells you the economy is a fixed pie and that successful entrepreneurs only become rich by making other people poor. Actually, allow me to revise my remarks. In the left’s fantasy world of taxes, bailouts, handouts, and cronyism, there is no growth and some people are able to use government coercion to become rich by ripping off others. But in all likelihood, this satirical image shows the true impact of statism and redistribution. on May 3, 2016 at 11:50 am Is “Capitalism” a Dirty Word and “Liberal” a Good Word? The left talks about a fixed pie rather than a growth model because their policies seem to end up with that result. Great article, I am going to play this in one of my Business classes! Graphs like this should always be in logarithmic form.